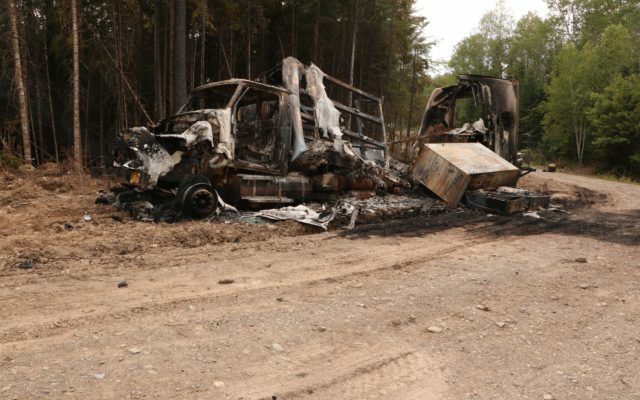 The Maine Forest Service and Maine State Fire Marshal's Office are investigating a suspicious fire on Labor Day that destroyed a logging service truck in the unorganized territory south of Presque Isle. T10, R3, Maine — The Maine Forest Service and Maine State Fire Marshal’s Office are investigating a suspicious fire on Labor Day that destroyed a logging service truck in the unorganized territory south of Presque Isle. The fire was reported around 11 a.m. Monday, Sept. 3, on an active logging site in Township 10, Range 3, a region known as the Burntlands south of the end of Chapman Road, said Steve Wipperman, a ranger with the Maine Forest Service. Members of the Presque Isle Fire Department and forest rangers responded to the site and found the fire burning a logging service truck owned by TNT Road Company in Fort Kent, Wipperman said. The crews quickly extinguished the fire, which impacted less than half-an-acre of woods on either side of the road, Wipperman said. No one was working at the site at the time and no other equipment was damaged, the ranger said. The land is owned by Prentiss & Carlisle, and forest rangers are continuing to monitor the site, Wipperman said. He said the Forest Service and Maine State Fire Marshal’s Office are investigating the cause of the incident and treating it as suspicious.